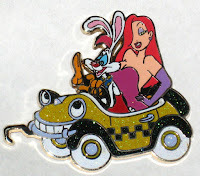 The stars of Disney are on parade in their own cars. This set features Mickey and Minnie Mouse, The Mad Hatter and March Hare, Chip and Dale, Stitch and Angel, Jack and Sally, and Roger and Jessica. Each car includes glitter filled elements. Each car had a hook and eye so they can be connected together.